Arthur Green from Quorn and Doris Ada Crowsley from Bedford, would never have met had it not been for the Second World War. Arthur was in hospital in Bedford and Doris was one of the nurses who helped him to regain his health. Wartime was difficult for young couples, when men (and women) were serving in the forces, and were often separated for long periods of time and many miles. Arthur and Doris were no exception and as an expression of their love and commitment they, like so many other young sweethearts, bought a ‘Mizpah’ brooch together. The Hebrew word ‘Mizpah’ is a symbol of hope for when couples are absent one from another. 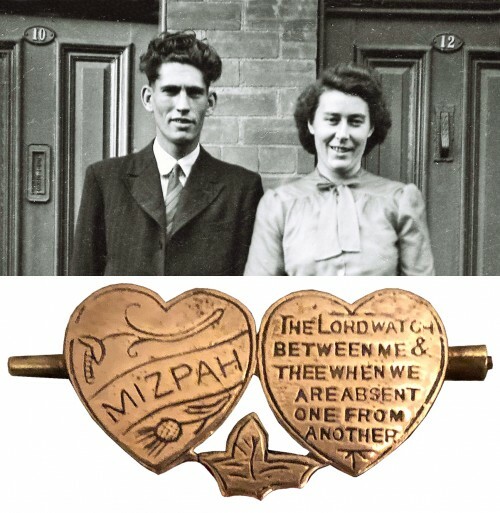 Mizpah brooches can come in different forms, but often include two hearts and the words as on Arthur and Doris’s brooch: “The Lord watch between me and thee, when we are absent one from another”. Arthur and Doris Green married shortly after the war ended in 1945, and started their life together at what is now 20 Wood Lane. This artefact was posted on 16th March 2019, on what would have been Arthur’s 100th birthday.